A Persian Legend of Zelda? Sure, Why Not. 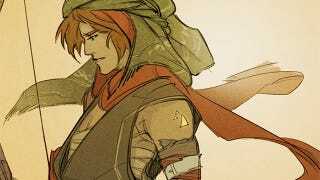 Artist Lenqi imagines a classic Persian take on The Legend of Zelda. It deserves a round of applause. Not just for shaking up the setting (which to be fair, has in recent years gone both "pirate" and "cowboy"), but for how well it fits. I'm getting visions of a Zelda game with the visuals from 2008's Prince of Persia, and it's making me feel kinda funny. Best part, though? That Triforce redesign. Love it.